Head of Azerbaijan’s State Committee for Work with the Diaspora Fuad Muradov met with Prime Minister of Georgia Mamuka Bakhtadze, Azvision.az reports with reference to the state committee on April 3. Bakhtadze noted that he has a very positive attitude towards the projects of the State Committee for Work with the Diaspora, implemented in connection with the Azerbaijanis living in Georgia, and highly appreciates this work. He instructed Ketevan Tsikhelashvili, the state minister for reconciliation and civic equality in Georgia, who was present at the meeting, to intensify ties with the State Committee and to carry out more joint projects. The meeting was also attended by Azerbaijani Ambassador to Georgia Dursun Hasanov and Deputy Chairman of the State Committee Faig Guliyev. On the same day, Fuad Muradov met with deputy chairman of the Georgian Parliament, Chairman of the Georgia-Azerbaijan Inter-Parliamentary Friendship Group Zviad Dzidziguri, who noted that Azerbaijan and Georgia are strategic allies, the Georgian and Azerbaijani peoples are friends and brothers, and also stressed the importance of further intensifying bilateral ties. The meeting was attended by Chair of the Diaspora and Caucasus Issues Committee of the Georgian Parliament Beka Odisharia, Azerbaijani members of the Georgian Parliament Mahir Darziev and Azer Suleymanov. The Azerbaijani side was represented by Ambassador Dursun Hasanov, representatives of the State Committee and other officials. 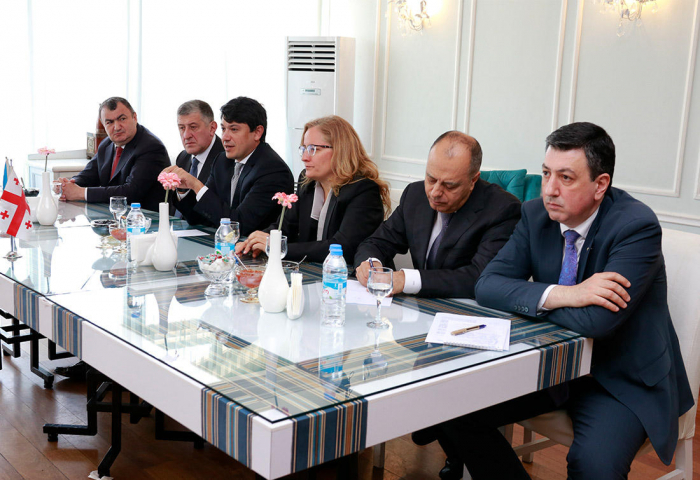 Muradov noted that, as the head of the State Committee, he paid a visit to Georgia for the first time last summer and studied the problems of Azerbaijanis living in Georgia. He stressed that projects are being prepared in the field of education, and on April 3, the opening ceremony of the Integration Center of Georgian Azerbaijanis will take place, and this will become the contribution of the Azerbaijani state in terms of the integration of Georgian Azerbaijanis into the local society. He added that quotas were allocated in Azerbaijan for receiving pedagogical and religious education for Azerbaijanis of Georgia in 2019-2020. Muradov also touched upon the issue of opening a monument to the Armenian separatist in Georgia, stressing that this doesn’t correspond to the current level of bilateral relations. Deputy chairman of the Georgian Parliament, Chairman of the Georgia-Azerbaijan Inter-Parliamentary Friendship Group Zviad Dzidziguri noted that the visit by Georgian President Salome Zurabishvili to Azerbaijan was held at a high level, adding that the Armenian media published articles against this visit. Azerbaijani MPs of the Parliament of Georgia Azer Suleymanov and Mahir Darziev delivered speech at the meeting. They noted that the erection of a monument to Armenian separatist in Georgia casts a shadow on bilateral relations. It was also emphasized that in Azerbaijan it is important to adopt the “Law on Compatriots”, and that it is necessary to promote Azerbaijani culture in Georgia, and Georgian culture in Azerbaijan.